Remodeling a kitchen is a big project with lots of different elements to balance, so it’s no surprise that mistakes can easily happen! Here are some of the most common issues to watch out for from our kitchen remodel team, so you don’t end up in the same boat. Mistake Number 1: Ignoring the Kitchen Triangle – The Kitchen Triangle is comprised of your fridge, refrigerator and stove, and getting this triangle wrong can severely disrupt the flow of your space. This might sound like a minor thing, but because these elements are often used at the same time it’s essential that you can move between them quickly, easily and unimpeded. 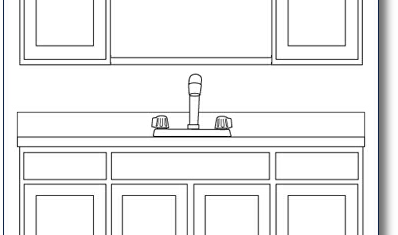 The last thing you want is a kitchen island blocking you off from the sink or refrigerator when you’re cooking! Mistake Number 2: Style over Function – Kitchens are a focus of the home, and it’s also become a heart of the design of a home, but that doesn’t mean that style should come first. Don’t spend all your time sourcing tiles and finishes, and end up with a kitchen where the dishwasher door blocks a doorway, or where you can’t open the refrigerator and a cabinet or pantry door at the same time. After all, the best kitchens are a pleasure to cook in as well as a pleasure to look at. Mistake Number 3: Forgetting about Lighting – Unlike other rooms, proper lighting is essential for the performance of a kitchen, so you can’t just replicate what’s in the lounge or bedroom. The best kitchens combine types of lighting – general ceiling lighting, under-counter lighting (task-lighting) and feature lighting (for example, hanging lights over a breakfast bar) – to ensure that the space is perfectly lit whether you are working at the stove or entertaining. Mistake Number 4: Not Maximizing Storage – Kitchens are workhorses, busy spaces that take a lot of household traffic, and where gadgets are king. This means two things – you need lots of counter space, and lots of storage. Every part of your kitchen should work to maximize this in order to create a highly functional space that’s clutter-free and easy to clean. So be sure to consider kitchen islands, breakfast bars and cabinets that reach to the ceiling. And mistake number 5? Not visiting NJ plumbing wholesalers! Want to save on your kitchen remodel? Visit your local plumbing wholesalers! At Crosstown Plumbing Supply, we offer a huge range of high quality cabinetry and countertops, as well as offering kitchen measurement services. In addition to stocking wholesale kitchen cabinets and supplies, we also offer special promotions on certain items throughout the year. These limited time offers are a great way to save even more on the costs of your renovation, as they often feature great discounts on solid wood cabinets, modern features and top international brands.